Using the NuStar telescope, NASA was able to collect data on violent shock waves from colliding winds that result in cosmic rays, some of which have been seen to bounce off the Earth’s magnetic field. Launched in 2012, the NuStar orbiter has been used to map selected regions of space and act as a census for collapsed stars. The telescope has also been tasked with investigating mysterious black holes, and last year documented the ‘energy eating’ phenomena in the Milky Way. Eta Carinae — a binary star system approximately 7,500 light-years away in the constellation Carina — is accelerating particles to high energies, some of which may reach Earth as cosmic rays, according to new data from NASA’s Nuclear Spectroscopic Telescope Array (NuSTAR). Astronomers know that cosmic rays with energies greater than one billion electron volts (eV) come to us from beyond the Solar System. But because these particles — electrons, protons and atomic nuclei — all carry an electrical charge, they veer off course whenever they encounter magnetic fields. This scrambles their paths and masks their origins. Eta Carinae, also known as HD 93308 and Hen 3-481, is a pair of massive stars whose eccentric orbits bring them unusually close every 5.5 years. The system was first cataloged by the English astronomer Edmond Halley in 1677, as a star of the fourth magnitude. The smaller star is about 30 times the mass of the Sun and may be as much as a million times more luminous. The primary star contains about 90 solar masses and emits 5 million times the Sun’s energy output. They pass 140 million miles (225 million km) apart at their closest approach, about the average distance separating Mars and the Sun. Both stars are fated to end their lives in spectacular supernova explosions. Between 1838 and 1845, Eta Carinae underwent a period of unusual variability during which it briefly outshone Canopus, normally the second-brightest star. As a part of this event, which astronomers call the Great Eruption, a gaseous shell containing at least 10 and perhaps as much as 40 times the Sun’s mass was shot into space. This material forms a giant hourglass-shaped nebula, called the Homunculus Nebula, which is now about a light-year long. “We know the blast waves of exploded stars can accelerate cosmic ray particles to speeds comparable to that of light, an incredible energy boost,” said Dr. Kenji Hamaguchi, an astrophysicist at NASA’s Goddard Space Flight Center. “Both of Eta Carinae’s stars drive powerful outflows called stellar winds,” added Dr. Michael Corcoran, also from NASA’s Goddard Space Flight Center. NASA’s Fermi Gamma-ray Space Telescope earlier observed a change in gamma rays from a source in the direction of Eta Carinae. But Fermi’s vision isn’t as sharp as X-ray telescopes, so astronomers couldn’t confirm the connection. To bridge the gap between low-energy X-ray monitoring and Fermi observations, Dr. Hamaguchi, Dr. Corcoran and co-authors turned to NuSTAR. Launched in 2012, NuSTAR can focus X-rays of much greater energy than any previous telescope. Using both newly taken and archival data, the researchers examined NuSTAR observations acquired between March 2014 and June 2016, along with lower-energy X-ray observations from ESA’s XMM-Newton satellite over the same period. 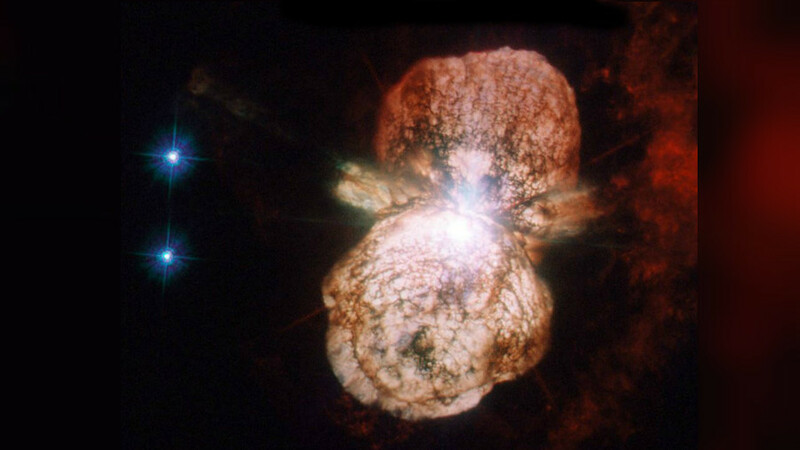 Eta Carinae’s low-energy, or soft, X-rays come from gas at the interface of the colliding stellar winds, where temperatures exceed 70 million degrees Fahrenheit (40 million degrees Celsius). But NuSTAR detects a source emitting X-rays above 30,000 eV, some three times higher than can be explained by shock waves in the colliding winds. For comparison, the energy of visible light ranges from about 2 to 3 eV. The team’s analysis shows that these hard X-rays vary with the binary orbital period and show a similar pattern of energy output as the gamma rays observed by Fermi. “The best explanation for both the hard X-ray and the gamma-ray emission is electrons accelerated in violent shock waves along the boundary of the colliding stellar winds,” the astronomers said. “We’ve known for some time that the region around Eta Carinae is the source of energetic emission in high-energy X-rays and gamma rays,” said NuSTAR principal investigator Professor Fiona Harrison, of Caltech. The findings appear online this week in the journal Nature Astronomy.